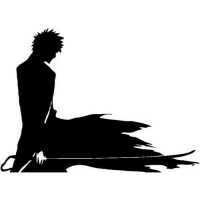 Ichigo Kurosaki Bankai Manga Anime graphic decals / stickers. Yoruichi tells Ichigo that he cannot save Rukia with his present power and asks him to train to achieve the bankai of his zanpakutō. Upon completing the training, he, along with Yoruichi and sympathetic captains Shunsui Kyōraku and Jūshirō Ukitake, separately converge upon the Sōkyoku to stop Rukia's execution. At the last possible second, Ichigo stops the execution, and proceeds to dispatch three lieutenants — Marechiyo Ōmaeda, Isane Kotetsu and Chōjirō Sasakibe — barehanded. He is then confronted by Byakuya Kuchiki. During this battle, Ichigo reveals his bankai against Byakuya, and outmaneuvers Byakuya's attacks. Byakuya counters using the second form of his bankai, and after a while Ichigo's endurance runs out, leaving him in critical condition. At this point, Ichigo's inner hollow surfaces and injures Byakuya to the point that both combatants have almost no power left. After regaining control of himself, Ichigo faces off against Byakuya in a final clash, each channeling all their energy into a single attack. After this final clash, neither has the strength to fight, but Byakuya admits his defeat because his blade was destroyed by Ichigo's. Size of decal 300mm wide x 217mm high.